Cambridge, MA Architect Thomas Downer Is On the Tailend of His Latest Project. 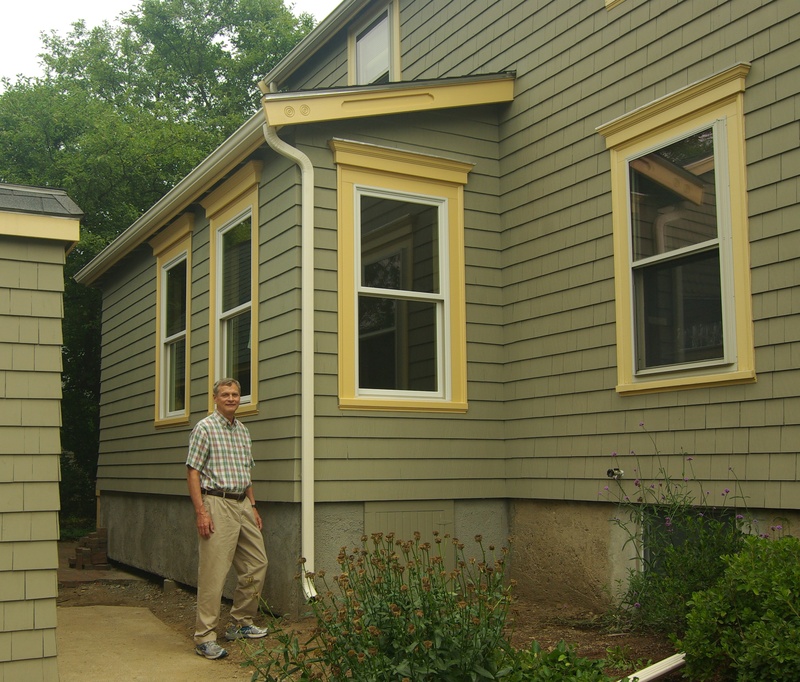 Cambridge architect Thomas Downer is completing a custom remodel and addition. His clients will have a much more accommodating living space when it is finished. 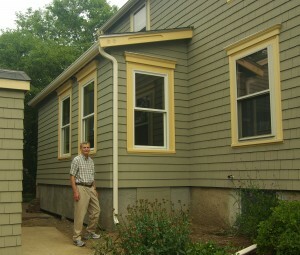 Cambridge architect Thomas Downer stops to take a photo before he goes into the house to inspect the work that had been done for that day. Cambridge architect Thomas Downer is in the midst of adding a first floor bath to his clients’ home. They are an older couple and the husband’s current medical conditions made it difficult for him to reach the second floor. This home remodel includes an addition to the existing structure and by using simple fixtures and finishes they were able to keep the cost well within the proposed budget. “Even with a fairly limited area to work with, we were able to provide a new full bath and other amenities that make staying in their home much more comfortable for Janet and Paul. By using similar materials and details the additions look to be part of the original design.”. The home is a 1920’s two story house with many Craftsman features, and some American Queen Anne details. The clients have lived there for over 40 years, and wanted to have a more comfortable living environment. This would mean they would have an accessible bathroom, easier access to the adjacent studio, and more natural light in the combined dining/family room. The limited amount of space on the first floor made it necessary to include an addition to create all of that. However, the town’s zoning rules restricted where they could start the new construction, because the house had to be a measurable distance from both of the side yards. To reach these goals they would have to add 6’x17’ to the rear of the house and 6’x12’ to the side of the home adjacent to the studio. The rear expansion provided the full bath with an accessible shower, and the rear access to the studio. The side addition, with the former exterior wall removed, enlarged the dining/family room. This provided the wall space for three large new windows. 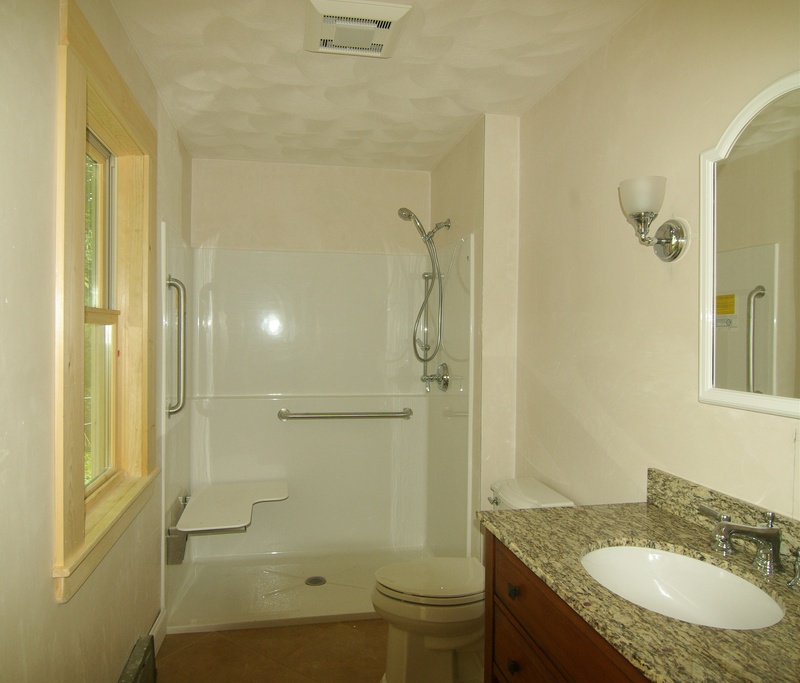 The new bathroom was constructed with a one piece fiberglass shower unit that is recessed into the floor. This will make it a lot easier to get in and out of, thereby creating a safer situation for the couple. The floor is resilient which will always be warm to the touch, and easier to clean as there is no grout to worry about. There will be ample room for storage as there is a vanity sink featured in this area. This residential remodel is nearly complete after a mere five weeks of construction. The home will now be more spacious, and more importantly, a home that this older couple can feel comfortable living. Tom's clients are happy to have an accommodating first floor bathroom.